Capture small leaks, drips and nuisance spills under equipment. Have a small leak or spill? Eliminate nuisance drip under vehicles, hydraulic lines, or equipment. The Dripillow Berm™ comes in four sizes to capture small leaks and drips. 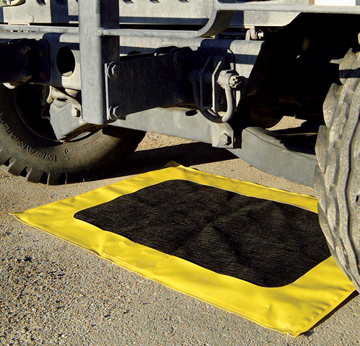 The weighted base prevents flipping or splashing in windy conditions or harsh weather. A portable drip pan that works with all fuels and hydrocarbons or harsh weather. Replacement UV protected pads available in cases of five. Folds for easy carrying and storage.